Ever since I have been bought up, during my lifetime, I have watched my parents, my relatives and people surrounding me indulge in ancient righteous the Hindu practice of special request messages to the Gods of the Navagrahas and the planets they represent, to shower their blessings and love and benevolence upon them. I like most Hindus I am sure never really understand the Navagrahas. Here is an exploratory around the Navagrahas, in the simplest way I can begin to take foothold on this mandatory practice each time a Hindu visits a temple. All that about the Navagrahas explained here is not at all exhausting, but it is an attempt to provide some guidance on these deities. 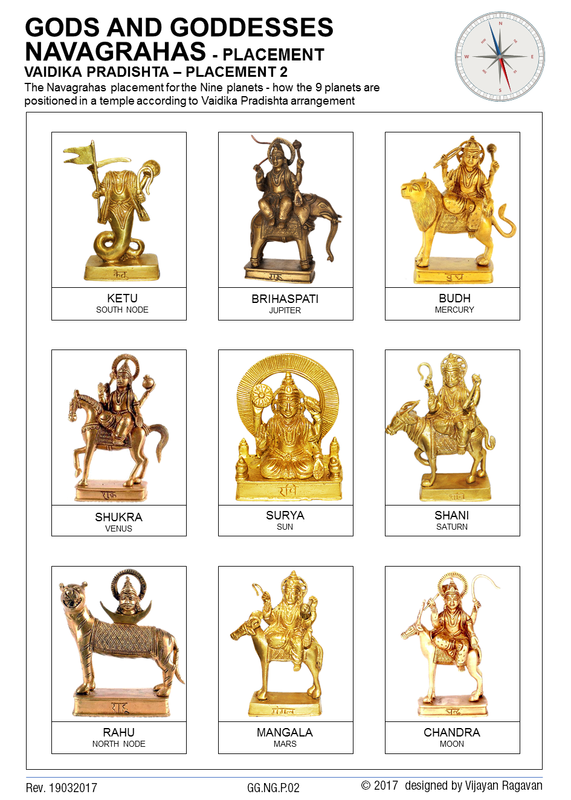 Nine planets collectively known as Navagrahas are represented as celestial bodies (dieties). Of the nine deities, seven are named after the planets in the solar system, and correspond with the names of the seven days in the week of the Hindu calendar. However, Rahu and Ketu are two deities who are actually demons. 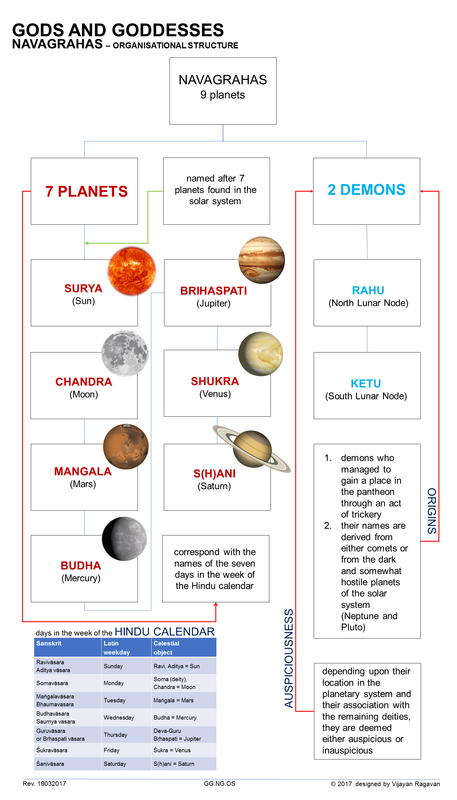 The Navagrahas are organised as shown in the chart below. Navagrahas are are found in most Hindu temples either grouped together on a panel or on a pedestal in commonly visible areas of the temple. Navagraha temples are temples devoted to Navagraha—the nine (nava) major celestial bodies (Grahas) of Hindu astronomy. Many temples in South India contain a shrine dedicated to the Navagrahas. However, the term Navagraha temples refers to a cluster of nine separate temples, each an abode of one of the Navagrahas. While Navagrahas are usually found in many temples as subordinate deities, there are some temples which are exclusively built for them where they are worshipped as the main deities. One such temple is the Navagraha temple located on the banks of the river Kshipra in the outskirts of Ujjain, a famous pilgrim center of Saivism in central India. Some times we also come across temples built exclusively for only one of the Navagrahas such as the temples built for Surya and Sani in many parts of India. For example, there is a famous temple of Sani near Hindupur, which is frequented by many devotees. Many temples in South India contain a shrine dedicated to the Navagrahas. In the Hindu Mythology, the Navagrahas have an exalted position in a persons life as they exert a great influence and it is said that the proper worship of these 9 planets can greatly tone down their malefic influence and thus grant peace and prosperity in a persons life. Devotees usually propitiate these gods before offering prayers to the main deity in the sanctum sanctorum of the temple. Worshipped in Hinduism for good luck or to overcome adversity, bad luck or misfortune arising from past karmas or birth related defects (dhoshas). Ancient Navagraha Mantras are invocation lines written by the great Rishis and Learned men of ancient times to appease, invoke and mollify the effects of planetary transits and please the Gods with our devotion. When we chant mantras, as is the specified pronunciation which is an important and most imperative part of chanting, we feel the positive vibes within ours system. If we talk about our physical body: it vibrates at certain frequency and this frequency always varies depends upon a person’s thoughts, emotions, way of living and life style etc. When we chant certain mantra for certain planet, it produces energy and help our physical energy in a way to cope up or neutralizing the effect of particular planet. There are certain Guru Mantras and Sadhanas /Meditations those are so powerful, if one does them, he is relieved from any kind of malefic planetary effects, black magic, wrong practices by other jealous people around, enemies practising, vodoo and witchcraft, because after doing them for certain period of time, that person vibrates more than planets. I will recommend making any meditation technique part of your life, because it will raise your consciousness and also raise beyond the planets and their effects. The entire place where the Navagraha is installed in a temple is a black granite stand and the Navagrahas are also black granite with the facial features not so well formed, but they are well decorated with the most favored colored cloth of the particular planet. entire pedestal that they are placed on has small channels that lead the water, milk, curd, yoghurt and oil abhisheka that the idols are regularly done to a clean place. The oil from the shani oil abhishek is collected to light the lamps in the temple. So on and so forth. As per Hindu customs, the Navagraha are typically placed in a single square with the Sun (Surya) in the center and the other deities surrounding Surya; no two of them are made to face each other. In South India, their images are generally found in all important Saiva temples. They are invariably placed in a separate hall, on a pedestal of about three feet in height, usually to the north-east of the sanctum sanctorum. There are 2 kinds of installation of the planets when arranged in this fashion, known as Agama Pradishta and Vaidika Pradishta. The charts below show these 2 arrangements and placement of each deity. 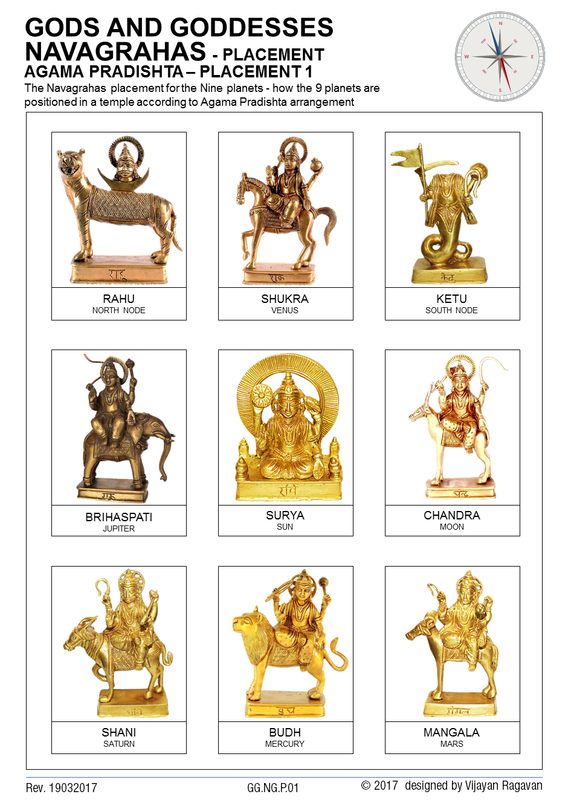 The nine planetary gods have a great significance in Vedic astrology. Hindu astrologers draw the birth charts of individuals based upon their position at the time of their birth. Depending upon where they are located in the astrological chart at a given time, they exert positive or negative influence upon people and their destinies. The position of Sani, Rahu and Ketu are especially considered important. If their positions are not favorable, astrologers suggest remedial measures to pacify the planets and ward off their negative influence.